Elevated Ki-67 (MIB-1) expression as an independent predictor for unfavorable pathologic outcomes and biochemical recurrence after radical prostatectomy in patients with localized prostate cancer: a propensity score matched study. BACKGROUND: Ki-67 is known to be useful in estimating the fraction of proliferation tumor cells in various malignancies. 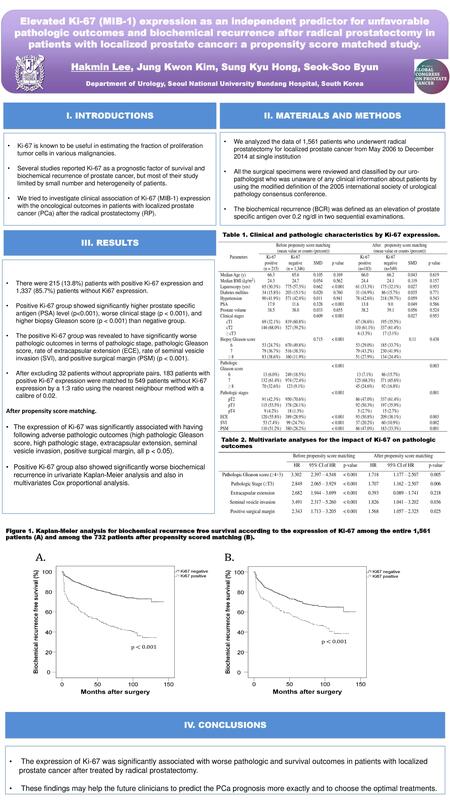 We tried to investigate clinical association of Ki-67 (MIB-1) expression with the oncological outcomes in patients with localized prostate cancer (PCa) after the radical prostatectomy (RP). METHODS: We retrospectively analyzed the data of 1,561 patients who underwent RP for localized PCa. According to the propensity score having Ki-67 expression, 183 patients with positive Ki-67 expression were matched to 549 patients without Ki-67 expression. By Using multivariate Cox-proportional hazards models and logistic regression tests, the prognostic value of each variables were tested. RESULTS: After propensity score matching, positive Ki-67 group showed significant worse clinical characteristics and pathologic outcomes than negative Ki-67 group. The multivariate analysis showed that the Ki-67 expression was significantly associated with several adverse pathologic outcomes including higher pathologic stage (p = 0.006), higher Gleason score (p = 0.005), seminal vesicle invasion (p = 0.036), and positive surgical margin (p = 0.025). The group with Ki-67 expression showed significant worse biochemical recurrence-free survival (p<0.001) than negative Ki-67 group. Subsequent multivariate Cox analyses showed that Ki-67 was independent predictor for BCR after RP (HR 1.506, 95% CI 1.150 – 1.974, p < 0.001). CONCLUSIONS: In our study, high Ki-67 expression was significantly related with adverse pathological and finally with worse biochemical recurrence-free survival. Further studies are needed to validate the prognostic value of Ki-67 more exactly in PCa patients.